The Big Play Thing IS EVEN BIGGER! Cascade Indoor Sports is thrilled to have Central Oregon's newest and largest indoor play structure, with more than 7,000 square feet of climbing adventure! We have recently added an entire new section as well as a new "Gecko" slide, two New "Racing" slides as well as a whole new play corridor. 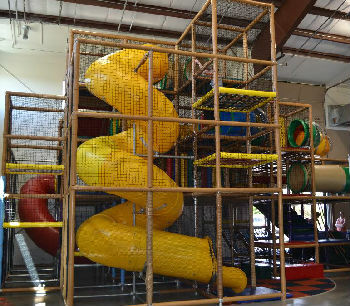 Kids love our "Macaroni" and "Chili Pepper" slides, as well as the foam forest, tubes, tunnels, web crawls and elevators, Tarzan bridge, a soft gauntlet, half moon roll climb, bridges, and more! The Big Play Thing is designed for children 4 and older (children under 4 are welcome with parental assistance). Parents do not have to pay. We offer lots of different Open Climb times each week and are available for Birthday parties too! We guarantee the fun! CHECK OUT OUR NEW VIRTUAL TOUR BY CLICKING THE LINK BELOW! Don't forget, complimentary WiFi is available for those who need to catch up on work or finish that mid term exam!